I am the first to acknowledge how blessed we all are to be celebrating the two hundredth anniversary of Wagner’s birth this year. However, I must admit it’s been quite a journey for me personally to arrive at an appreciation of his work. When I was growing up in Detroit, I was constantly surrounded by music, a tradition engendered by my Russian-Jewish émigré parents. My father was my first violin teacher. My mother, having attended the magnificent Odessa opera house as a young girl, was a fanatic opera buff, who listened to the Met broadcasts faithfully every Saturday afternoon. Except when it came to Wagner. I never fully understood her post-Holocaust view of Wagner until I was much older, but the seeds of that ambivalence were planted in my mind at an early age. This began to change when I went to a high school that targeted the city’s best and brightest students, who could “major” in any number of esoteric specialties. Naturally I chose music as my emphasis. The orchestra was a marvel. Our dynamic Russian conductor made sure we studied and performed the most important symphonic classics. But amongst the Beethoven, Brahms, Mendelssohn, Tchaikovsky and Schumann, I found no Wagner, until one day Siegfried’s Rhine Journey appeared on my music stand. Playing it was a revelation: gorgeous music, so energetic and so much fun to play. What was my mom thinking? Later on I dated a Wagner fan, who one day sat me down to listen to a modest little work entitled Prelude und Liebestod from Wagner’s Tristan. I was completely unprepared for the emotional upheaval this piece unleashed in me . I felt as if I had been turned inside out, wrung out and hung out to dry. Not a comfortable feeling. I then began to suspect my mom was onto something. Ever a glutton for punishment, after college I married a Wagner fanatic, who insisted we listen to endless hours of Wagner opera LPs night after night – emphasis on The Ring – occasionally providing comic relief from these marathons with the Anna Russell version that clocked in at forty-five minutes. Nonetheless I learned those operas inside out, never suspecting what a huge advantage this would afford me when I was subjected to the entire Ring in my very first season as a Met Opera violinist. After all those hours of listening to the recordings, the music was engraved on my being; I soaked it up like a sponge. But I didn’t quite love it. Yet. I soon learned that pacing was the all-important key to surviving these operas, but still Wagner’s Ring was tough: difficult passagework; long, grueling rehearsals; five- and six-hour performances. Recording sessions were just as arduous. My muscles ached. My eyes stung. My enthusiasm for the Rhine Journey palled when I discovered it was but one small segment of a six-hour Wagnerian binge. I began to feel nostalgia for Anna Russell’s rendering. After a few years of this operatic torture, however, my appreciation for the Nibelungs’ journey started to burgeon. Excerpts like the Feuer Musik, Brünnhilde’s Heil Dir, Sonne! and the famous Ride lit a fire in my musical psyche. I stopped worrying and allowed the love to take over. Except when it came to Tristan. Evidently I had never gotten over that first disastrous hearing of the Prelude, because my newfound passion for Wagner did not apply to this heavy duty Handlung. The controversial piece may have been fifty years ahead of its time in its Chromaticism, taxing the very limits of nineteenth century tonality, even pointing the way to twentieth century serialism, but I still felt emotionally ambushed whenever I heard or played it. I was gratified to discover I wasn’t alone in that regard. 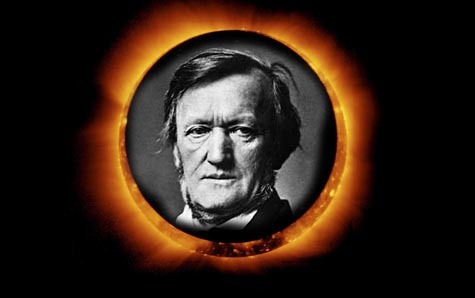 Critics and famous artistic personalities of Wagner’s time expressed both outrage and ecstasy over Tristan. The German periodical Allgemeine Musikalische Zeitung called it“the glorification of sensual pleasure… the ruination of the life of heroes through sensuality.” Renowned pro-Brahms critic Eduard Hanslick said the Prelude reminded him of “the old Italian painting of a martyr whose intestines are slowly unwound from his body on a reel,” while Clara Schumann declared Tristan “the most repugnant thing I have ever seen or heard in all my life.” No wonder the first tenor capable of learning the role died from the exertion of singing it, and two conductors collapsed and died after conducting the second act. Tristan killed them all. Controversy was perhaps the most inescapable leitmotif of Wagner’s life. Tristan proved him capable of pushing all corners of that envelope. I admire the piece; I could never love it. But after twenty-one years of performing The Ring, those fifteen to twenty-two hours (depending on who is conducting), of a size and scope unrivaled by anything else represented on the world’s stages today, my admiration for its greatness just intensifies as I continue to study the work. On the list of reasons to revel in this commemorative Wagner year, this opera cycle for all seasons will always for me remain poised at the top.